Goa is famous for its temples that attract numerous devotees from all over the world. 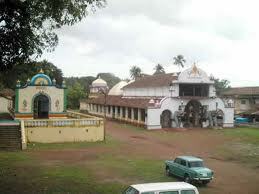 Many people tend to think of Goa as a Christian community and are not aware of the famous temples located here. During the Portuguese rule, many Hindu temples were destroyed in a zeal to spread Christianity. But as time passed, the Portuguese allowed the construction of Hindu temples and one of the earliest temples under the Portuguese was built around 1818. The style of construction of Goan temples is also different from other Hindu temples due to a different historical background. Located in Pernem, the Sri Bhagawati temple is dedicated to Goddess Durga. This temple is supposed to be over 500 years old and is dedicated to Goddess Ashtabhuja or Eight Handed Goddess. The temple is constructed in a grand style and the entrance is flanked by two statues of elephants.